This month’s business profile will be fun to write. 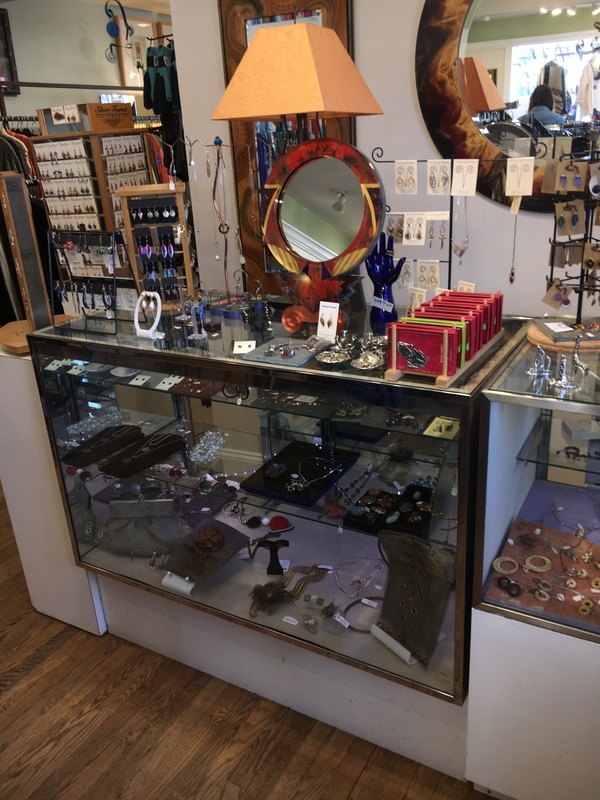 Imagine Artwear is one of the great success stories in Old Town Alexandria and owner Carol Supplee has worked tirelessly behind the scenes with the city and business groups. I started the Old Town Crier in January o1988 and when Carol bought her store in 1992 she began advertising with us and has every month since. I love success stories in Old Town, but it takes hard work. Carol first discovered the American crafts world as she pursued a journalism and history degree at Northwestern University and that is where her interest in hand crafted art emerged. “My Mom loved to sew and she was very good at it. She made all of the clothes for her three daughters and she taught me to sew as well,” says Supplee. Carol’s Grandmother’s last name was Penland as in the name of the Penland School of Crafts established in the early 1920’s in North Carolina and is the largest and oldest professional craft schools in the United States. Carol married and when her husband was transferred to Virginia she came along and transferred to George Washington University to continue her education and graduated with a degree in Art History and a Masters in Museology. In 1976 Carol worked for the American Freedom Train to commemorate the United States Bicentennial. The train itself consisted of 10 display cars each representing a segment of American history. Her job was to select all of the American Art for one of the cars. The train carried more than 500 treasures of Americana throughout the 48 states. Later Carol moved into the corporate world and worked with many prestigious ad agencies including Williams Whittle of Alexandria in her 15 year career in bank marketing. When the savings and loan crisis hit, she was out of a job and began to look around. This is when she discovered Fiber Designs in Old Town and her interest in fiber arts was reborn. “The store was a starting point, and even had its own working loom,” she says. In 1992 she combined her skills in marketing and her love of fiber art and bought the store. “I wasn’t sure that I had made the right decision and I would cry all the way in on my drive to work,” she remembers. Then she got to work and began to carry designs from small studio designers and held her first trunk show. “The Washington Post wrote a very positive article and customers began to show up. This is when I knew it would be all right,” she says. Carol credits her retail intuition to her father, who was a retail pharmacist in Minnesota and a very successful businessman. As her two sisters became old enough to work, they would work at the soda fountain at the pharmacy. When Carol was old enough to work she asked the owner of the dress shop next door for a job. This was a beginning. A few years after Carol bought Fiber Designs she changed the name to Imagine Artwear. In 1997 after a lease disagreement, she moved Imagine Artwear to its current location at 1124 King Street. Today she carries the best in contemporary clothing, jewelry and crafts by American Artists. 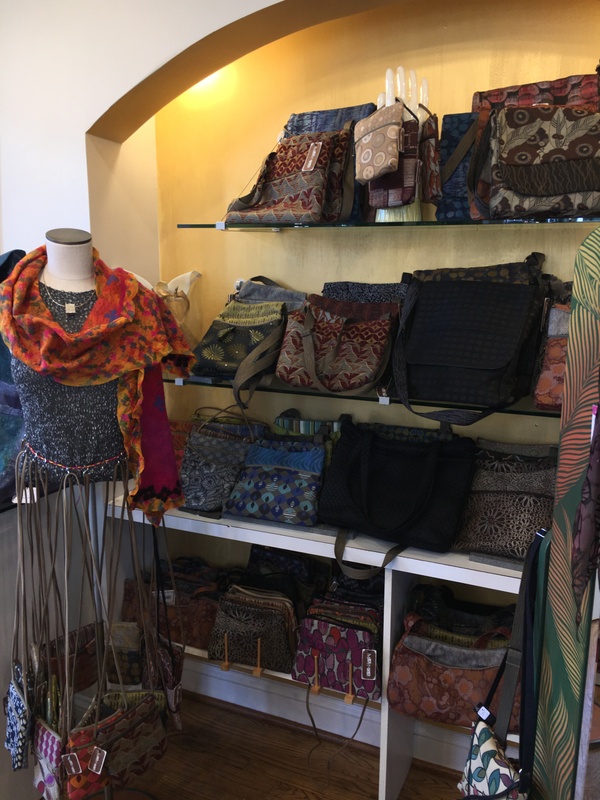 The store is more of a gallery dedicated to displaying the talents of weavers, painters, surface designers, jewelers, potters, glass artists and furniture makers. Imagine Artwear has attracted an international audience to its doors and is an upscale craft fair that happens year round! Carol has established great personal friendships with several of the artisans that she contribute to her inventory. Each year their trunk shows are a bit hit. 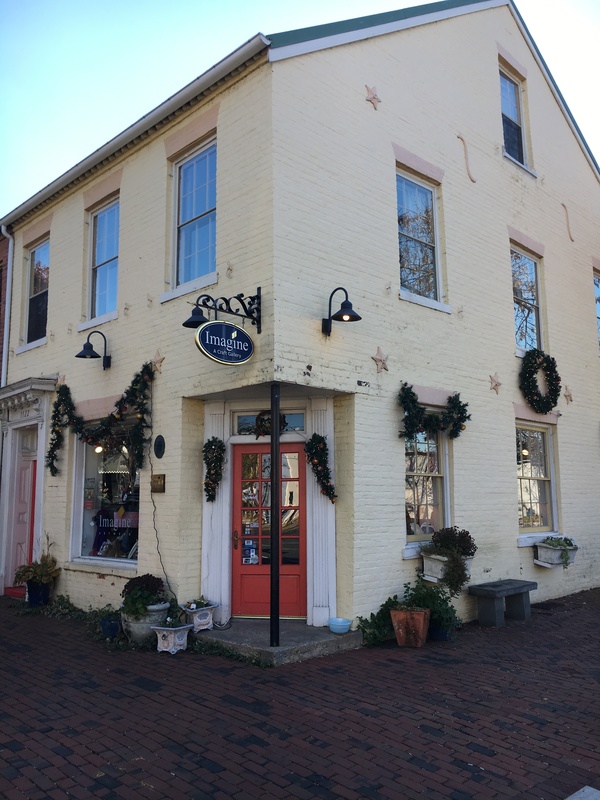 Carol’s interest in her business is so profound that she has also amassed a collection of crafts and arts from around the globe that she proudly displays in her home here in Alexandria. She is also actively involved in the Old Town Business and Professional Association and is a current board member and past president. Imagine Artwear is a sponsor of ManneqArt, an international arts and education non-profit that inspires creativity, teaches problem solving skills, and rewards excellence in Sculpture on the Human Form. Its focus is bringing Wearable Art to the attention of the American public. Look for the yellow building on the corner of King and Fayette and stop in and treat yourself to some sophisticated charm. Imagine Artwear has also hosted popular Alexandria First Night events for at least 15 years. This year they will be hosting The Tom Teasley Duo. Last year they hosted The Susan Jones quartet. In addition to being a great business woman with amazing taste in clothes, Carol is one of the most active, giving, nicest, community minded persons in Old Town. So very glad she is a part of our community.